For the Italian national anthem, see Fratelli d'Italia. 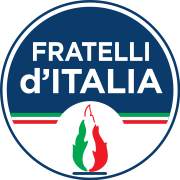 Brothers of Italy (Italian: Fratelli d'Italia, FdI) is a national-conservative political party in Italy led by Giorgia Meloni. The party, created from a split of The People of Freedom (PdL) in December 2012, is the main heir of the Italian post-fascist conservative tradition that had the Italian Social Movement (1946–1995) and National Alliance (1995–2009) as its main political representatives. National Alliance was merged into the PdL in 2009, but its bulk is now with the FdI. Giorgia Meloni and Guido Crosetto. In November 2012, Ignazio La Russa and Maurizio Gasparri, leaders of the Protagonist Right, a faction within The People of Freedom (PdL), announced their support for Angelino Alfano in the party primary scheduled for December. The subsequent cancellation of the primary was not agreed with by La Russa and many others in the party. On 16 December, Giorgia Meloni and Fabio Rampelli, Guido Crosetto and Giuseppe Cossiga organised in Rome the so-called "Primaries of Ideas", in which they openly criticised Silvio Berlusconi's leadership and any possible prospect of an electoral alliance with Prime Minister Mario Monti, proposed by some leading factions of the party (Liberamente, Network Italy, Reformism and Freedom, Liberal Populars, New Italy, FareItalia, etc.). On 17 December, La Russa, one of the three PdL national coordinators, announced he was leaving the party in order to form "National Centre-Right", including not just right-wingers, but also Christian democrats and liberals from Forza Italia (FI) like Crosetto and Cossiga. The split from the PdL was agreed with Berlusconi in order to better represent the Italian right and offer an appealing choice to right-wing voters. Simultaneously, Crosetto and Meloni announced the formation of "Brothers of Italy", whose name was taken from the first line of the national anthem. On 21 December the two groups, formed mainly by former members of National Alliance (La Russa, Meloni, Rampelli, Massimo Corsaro, Viviana Beccalossi, Alfredo Mantica, etc.) joined forces as Brothers of Italy – National Centre-Right, usually shortened to "Brothers of Italy" (FdI). La Russa's followers soon formed their own groups in most regional councils, starting with the Regional Council of Lombardy, and the Senate. Carlo Fidanza and Marco Scurria, MEPs in the European People's Party group, also joined the party. In the 2013 general election held in February, the party obtained 2.0% of the vote and nine seats in the Chamber of Deputies. On 5 March 2013 the party's executive board appointed La Russa president, Crosetto coordinator and Meloni leader in the Chamber. During 2013 presidential election's fourth ballot, the FdI decided to support Franco Marini, a Democrat supported also by the PdL and Lega Nord. Following the unsuccessful outcome of the vote, the FdI started voting for colonel Sergio De Caprio, known for having arrested Mafia boss Totò Riina. On 29 April 2013 Meloni announced in the Chamber of Deputies the party's vote of no confidence for Enrico Letta's government of Enrico Letta, supported by the Democrats, the PdL and Civic Choice. The party would stay in opposition for the entire parliamentary term. In the May–June 2013 local elections, the FdI increased its electoral support, especially in Central and Southern Italy. In September 2013, the FdI launched "Workshop for Italy" (Officina per l'Italia, OpI), a political initiative aimed at broadening the party's base. The newly formed OpI's political committee, led by Cossiga, included, among others, former minister of Foreign Affairs Giulio Terzi di Sant'Agata, former members of National Alliance (notably including Gianni Alemanno, Mario Landolfi, Sergio Berlato, Adolfo Urso and Souad Sbai), former members of FI (including former Socialists like Giulio Tremonti and Antonio Guidi, and former Christian Democrats like Fabio Garagnani), former members of the Union of the Centre (Magdi Allam and Luciano Ciocchetti), and a former member of Lega Nord (Oreste Rossi). Alemanno's Italy First and Urso's FareItalia were to join the FdI by February 2014. In December 2013, the "National Alliance Foundation", the association in charge of administering the assets of the defunct party, authorized the FdI, supported by Alemanno and Urso, to use the logo of AN in the 2014 European Parliament election, despite opposition from an alternative front composed of The Right, Future and Freedom, Tricolour Flame, I South, New Alliance, etc. let alone the former members of AN who had joined FI like senators Maurizio Gasparri and Altero Matteoli. In February 2014, the party organised a "primary" in which members and supporters agreed to change the party's name to Brothers of Italy – National Alliance, chose the new symbol (including the former one of AN) and voted Meloni for president. In March, during the party's first congress, the FdI ratified the primary's outcome and declared Meloni president. In the EP election, the FdI obtained 3.7% of the vote and no seats, while doing well in Central and Southern Italy, especially in Lazio (5.6%), Umbria (5.4%), Abruzzo (4.7%) and Campania (4.5%), as well as in north-eastern Friuli-Venezia Giulia (4.4%). In October 2015, during an assembly of the Foundation, the representatives of the FdI, supported by former AN heavyweights who had remained in the PdL, won a decisive vote over a front led by Alemanno, who had left the FdI earlier, joined forces with former allies of Gianfranco Fini and wanted to form a larger party (including the FdI). The FdI thus retained the use of AN's name and symbol, while Alemanno announced that he would create a "Movement for the United Right". In November 2015, it was announced that the party would undergo a new process of enlargement and that a new party, named Our Land (TN), would be launched by January 2016. TN would comprise the FdI, along with other right-wing politicians, notably including Alberto Giorgetti (a deputy of FI, who was long a member of AN), Giuseppe Cossiga (former deputy of FI and founding member of the FdI) and Walter Rizzetto (deputy of Free Alternative, originally elected with the Five Star Movement). In March 2016 Rizzetto officially joined the FdI and, contextually, it was announced that the party's group in the Chamber would be renamed "Brothers of Italy–Our Land". The name change never happened, but the party's enlargement continued with the switch of two deputies from FI. In the 2016 municipal election in Rome, Meloni ran for mayor with the support of Us with Salvini, but in opposition to the candidate supported by FI. Meloni won 20.6% of the vote, almost twice than FI's candidate, but did not qualify for the run-off, while the FdI obtained a convincing 12.3%. In the November 2017, Sicilian regional election Nello Musumeci, a conservative close to the party, was elected President of Sicily. In December 2017, during the party's second congress, Meloni was re-elected president, the party was re-named simply Brothers of Italy and a new symbol was unveiled. In the event, the FdI welcomed several newcomers, notably including Daniela Santanchè and Bruno Mancuso, respectively from FI and Popular Alternative (AP). Mancuso became the party's third senator, after Stefano Bertacco and Bartolomeo Amidei had switched from FI in the previous months. Additionally, Crosetto and Urso returned to an active role in the party. Finally, Alessandro Urzì took his Alto Adige in the Heart party into the FdI. In the 2018 general election the FdI obtained 4.4% of the vote and more than thrice the seats won in 2013. In November 2018, in the run-up to the next European Parliament election, the party agreed to join the European Conservatives and Reformists (ECR) group in the European Parliament, opening the way for a pact with other minor conservative parties in Italy, notably including Raffaele Fitto's Direction Italy. In February 2019, Marco Marsilio won 48.0% of the vote in the Abruzzo regional election and became FdI's first president of region. For the EP election the FdI recruited several high-profile candidates, including five outgoing MEPs (two of Direction Italy, plus three more recent splinters from FI: Fabrizio Bertot, Stefano Maullu and Elisabetta Gardini), other former FI heavyweights (Alfredo Antoniozzi and Monica Stefania Baldi) and renowned sociologist Francesco Alberoni. The FdI traces its roots in the history and values of the Italian Social Movement and National Alliance. The party's main ideological trends are Italian nationalism and conservatism, and its ideology includes also a Eurosceptic sentiment (mainly against the treaty of Lisbon). I the South (Io Sud), led by Adriana Poli Bortone. Alemanno and Poli Bortone left the FdI, along with their factions, in December 2014 and April 2015, respectively. ^ In a joint list with Direction Italy. ^ In a joint list with Forza Italia. ^ In a joint list with Alto Adige in the Heart. ^ In a joint list with Us with Salvini. ^ a b c Nordsieck, Wolfram (2018). "Italy". Parties and Elections in Europe. Retrieved 21 May 2018. ^ "Brexit, si teme effetto domino. Ecco gli euroscettici d'Europa". Rai News24. 24 June 2016. ^ "Giorgia Meloni batte moneta: "Ad Atreju niente euro"". Libero. 22 September 2015. ^ "Berlusconi im Wahlkampf". ZDF. 1 February 2018. ^ Italy election: What was the result and what is the Five Star Movement? The Independent. Author - Samuel Osborne. Published 6 March 2018. Retrieved 17 June 2018. ^ An introduction to Italy's small political parties. The Local (Italy edition). Author - Catherine Edwards. Published 11 September 2017. Retrieved 17 June 2018. ^ Sicily’s Political Theater Has Colorful Cast and Big Implications. The New York Times. Author - Jason Horowitz. Published 2 November 2017. Retrieved 17 June 2018. ^ Italy's 5-Star, League talks progress, PM may be in sight. Reuters. Authors - Gavin Jones and Massimiliano Di Giorgio. Published 13 May 2018. Retrieved 17 June 2018. ^ James Politi & Davide Ghiglione, Meloni takes Italian far-right back to 1930s roots, Financial Times (10 February 2018). ^ Jacopo Barigazzo, Far-right leader rejects idea of Emma Bonino as Italy's PM, Politico (26 February 2018). ^ Eric Sylvers, Italy's Far Right Flexes Campaign Muscle, Wall Street Journal (15 November 2017). ^ James Politi, Spectre of immigration sparks rightward turn in Italy, Financial Times (15 November 2017). ^ "Primarie Pdl: La Russa-Gasparri ufficializzano sostegno Alfano". La Stampa. Retrieved 19 May 2015. ^ "Pdl, la destra in fermento La Russa se ne va e fonda "Centrodestra nazionale"". Corriere della Sera. 18 December 2012. ^ "Meloni e Crosetto dicono addio Ma il Cavaliere si riprende il Pdl". Archiviostorico.corriere.it. Retrieved 19 May 2015. ^ "Lombardia, nasce il gruppo Centrodestra Nazionale". Milanotoday.it. Retrieved 19 May 2015. ^ "senato.it - Composizione del Gruppo Fratelli d'Italia - Centrodestra Nazionale nella XVI Legislatura". Leg16.senato.it. Retrieved 19 May 2015. ^ "Elezioni 2015". Elezioni.interno.it. Retrieved 19 May 2015. ^ February 2013&tpa=I&tpe=A&lev0=0&levsut0=0&es0=S&ms=S "::: Ministero dell'Interno ::: Archivio Storico delle Elezioni - Camera del 24 Febbraio 2013" Check |url= value (help). Elezionistorico.interno.it. Retrieved 19 May 2015. ^ "Quirinale, Fratelli d'Italia candida il Capitano Ultimo - Tgcom24 - Foto 1". Tgcom24.mediaset.it. 18 April 2013. Retrieved 14 May 2016. ^ di Gloria Sabatini (23 February 1976). "Da Atreju nasce l'Officina per l'Italia. Meloni: la sfida è lanciata, ma niente rendite di posizione - Secolo d'Italia". Secoloditalia.it. Retrieved 19 May 2015. ^ "Ecco programma e fini (anti euro) del Partito della Nazione di Giorgia Meloni". Formiche. Retrieved 19 May 2015. ^ "A Fiuggi La Casa Comune Della Destra Per Fare Il Partito Della Nazione | Prima L'Italia". Primalitalia.net. 13 February 2014. Archived from the original on 10 March 2014. Retrieved 19 May 2015. ^ "FdI utilizzerà logo An ad europee - Top News". ANSA.it. 18 November 2013. Retrieved 19 May 2015. ^ "Storace, Menia e Poli Bortone, il trio che si coalizza per contendere la destra al duo Meloni-La Russa". Formiche. 17 October 2013. Retrieved 19 May 2015. ^ "Ecco le macerie della destra italiana: liti, mozioni e veleni". Formiche. 16 December 2013. Retrieved 19 May 2015. ^ "Fratelli d'Italia, ritorno di fiamma: le primarie scelgono simbolo e presidente nazionale" (in Italian). IlGiornale.it. 26 February 2014. Retrieved 19 May 2015. ^ "Fratelli d'Italia-Alleanza Nazionale | Primo congresso nazionale | Fiuggi". Polisblog.it. Retrieved 19 May 2015. ^ May 2014&tpa=I&tpe=A&lev0=0&levsut0=0&es0=S&ms=S "Dipartimento per gli Affari Interni e Territoriali" Check |url= value (help). elezionistorico.interno.gov.it. ^ QuestIT s.r.l. "Archivio Corriere della Sera". Archiviostorico.corriere.it. Retrieved 14 May 2016. ^ Michele Esposito, Ansa. "An, Giorgia Meloni si tiene il simbolo e sconfigge Gianni Alemanno e Gianfranco Fini". Huffington Post. Retrieved 14 May 2016. ^ "Fratelli d'Italia lancia "Terra nostra": a fine novembre la prima assemblea - Secolo d'Italia". Secoloditalia.it. 23 February 1976. Retrieved 14 May 2016. ^ "Nasce Terra nostra, parte il derby a destra tra Fini e Meloni". IlGiornale.it (in Italian). Retrieved 14 May 2016. ^ "Fdi, "Terra nostra" per ampliare destra - Italia - La Gazzetta del Mezzogiorno". Lagazzettadelmezzogiorno.it. Retrieved 14 May 2016. ^ "Ex M5s Walter Rizzetto aderisce a Fratelli d'Italia: "Una scelta di cuore e non di calcoli"". Il Fatto Quotidiano. Retrieved 14 May 2016. ^ "Walter Rizzetto cambia ancora e sceglie FdiAn - Cronaca - Messaggero Veneto". Messaggeroveneto.gelocal.it. 23 March 2016. Retrieved 14 May 2016. ^ "Meloni: "Oggi Fratelli D'Italia si arricchisce con l'ingresso di Walter Rizzetto, ex M5s"". Corriere TV. Retrieved 14 May 2016. ^ "XVII Legislatura - XVII Legislatura - Deputati e Organi Parlamentari - Composizione gruppi Parlamentari". www.camera.it. ^ Stefanoni, Franco (12 March 2017). "Fratelli d'Italia: via An e Msi dal simbolo. Entra Santanchè: "Tornata a casa mia"". Corriere della Sera. ^ "Nel dibattito del secondo giorno di Congresso riaffermate le tesi dei patrioti". Secolo d'Italia. 3 December 2017. ^ "La Santanché cambia ancora casacca: "Sono tornata a casa, nella famiglia di Fratelli d'Italia"". L’Huffington Post. 3 December 2017. ^ "Delegazione messinese al congresso di Fratelli d'Italia, aderisce il senatore Mancuso". 4 December 2017. ^ S.p.A, Società Editrice Athesis. "Bertacco "torna a casa": entra in Fratelli d'Italia". L'Arena.it. ^ "Il senatore Amidei passa con Fdi. Video". Affaritaliani.it. ^ "Non soltanto la Santanchè. Meloni, un altro colpo clamoroso: quale super-big va con lei / Foto". www.liberoquotidiano.it. ^ "Fratelli d'Italia: nuovo simbolo e rinforzamento del Partito in Trentino". 4 December 2017. ^ Pavesi, Giovanna. "Ora la Meloni porta FdI nel gruppo Ue guidato dai polacchi di Visegrad". ilGiornale.it. ^ "Meloni: "Con i Conservatori per cambiare la Ue. Pronta a candidarmi" (video)". Secolo d'Italia. 6 November 2018. ^ "Fitto (Ecr), con Meloni verso gruppo sovranista italiano - Altre news - ANSA Europa". ANSA.it. 6 November 2018. ^ "Centrodestra, la marcia di avvicinamento tra Raffaele Fitto e Giorgia Meloni". Affaritaliani.it. ^ "Elezioni Abruzzo, i risultati: vince il centrodestra, Marsilio governatore. Lega primo partito, crollo M5s". Repubblica.it. 10 February 2019. ^ "Fratelli d'Italia: dova va la destra italiana". i Mille. 24 March 2014. Archived from the original on 24 September 2014. Retrieved 10 August 2014. ^ "Fratelli d'Italia riaccende la "fiamma". Nel nuovo logo i simboli di Msi e An". TGcom24. 16 February 2014. ^ "Fratelli d'Italia attacca: "Ci vuole il coraggio di dire addio all'euro"". il Giornale. 9 March 2014.